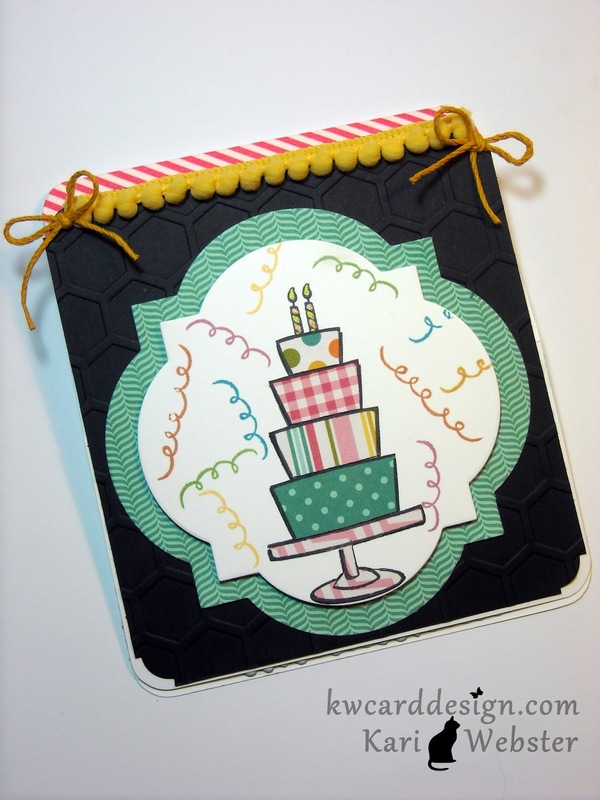 KWCardDesign : LSC #49 - Happy Birthday, Lawnscaping! LSC #49 - Happy Birthday, Lawnscaping! Happy New Year Everyone! I haven't posted since Christmas - so I thought I would wish everyone a happy and healthy 2013!! It is time for another post for my favorite challenge blog, Lawnscaping. It is time to party!! Lawnscaping is celebrating two years - which is awesome! I hope they have many more birthdays!! Here is the card when its flat. Happy Birthday Lawnscaping!! You make it so fun to play with my Lawn Fawn stamps!! Here's to many birthdays in the future!! I am also going to enter this card into the first EVER Pinspired Challenge! They are having a party too!! So fun! This is a great way to come back after the Holidays! And the perfect occasion to ink up a new stamp set! I love it :) Thanks for playing with us at Lawnscaping! 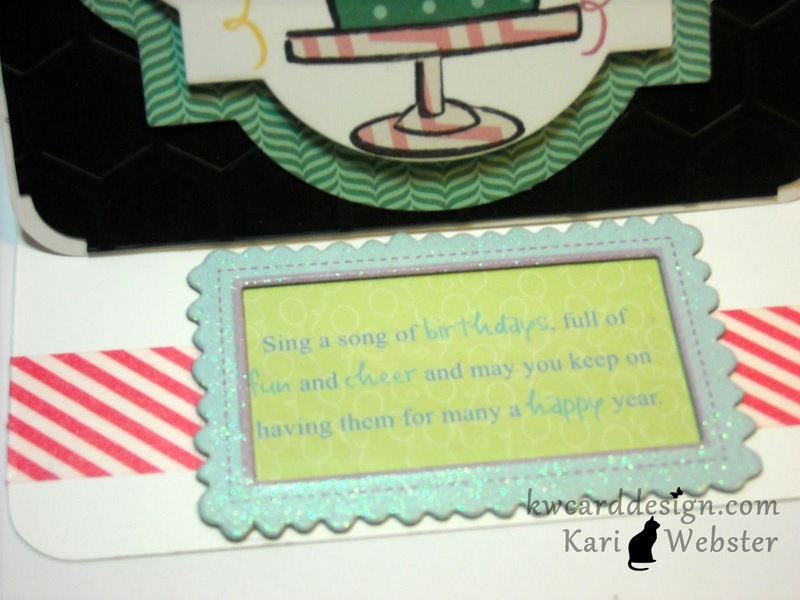 fun card Kari, perfect for the challenge! kari this is such a great card. the honeycomb looks so cool on the black card stock! I love the colors and the patterns! I'm also loving the pom poms at the top of the card. You rocked it! OOOH, this is FABULOUS, Kari! I totally love that you gave Lawnscaping two candles for their birthday, and I love all of the little details about this card. AWESOME!! (I love Lawnscaping too--how perfect that their challenge and Pinspired's challenge matched this time!) Thanks for playing along at Pinspired, I hope to see you around there often!! Oh Kari! How cute is this!!!!!!! I love love love that you put two candles on the cake for Lawnscaping's birthday. Clever girl! Your patterns on the cake are fantastic! Love the bows at the top! Love! Fun card! The cake and the streamers are perfect for both challenges! Thanks for playing with us at Pinspired Challenges! Absolutely love this card, Kari! So fun! And the two candles for Lawnscaping's second birthday is such a sweet touch! Love it to pieces. Thanks so much for playing with us at Lawnscaping for our birthday challenge! This is one fab fab card. The embossing and ribbon are just sooo much fun!!! Thank-you sooo much for joining in on the first ever pinspired challenge...this card is super fabulous!!! 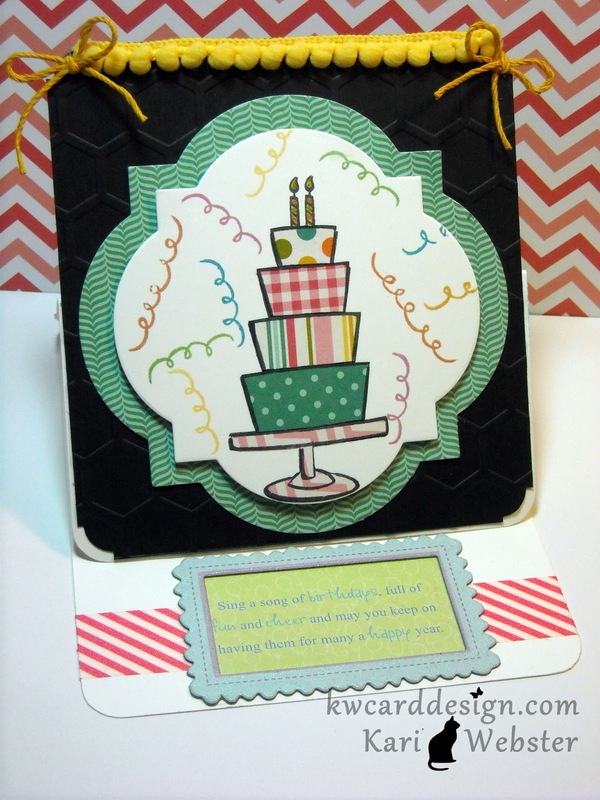 Kari your card is so fun..I totally love the design...great take..thanks for joining us at Pinspired challenge..